Chances are that if you know anything about eco-friendly children's toys around the world, you know the name HABA. Recipients of almost every toy award that exists, HABA offers furniture, toys and accessories for children of all ages to help them learn and grow. Enjoy bath time with bright and entertaining Bath Accessories, create and imagine with Discovery Blocks and love and pretend with their gorgeous collection of Dolls. For the child learning to walk, there are an array of colorful Walker Wagons to help them take those first steps... and once that momentous occasion has occurred, there are adorable Pulling Toys to encourage them to keep on going. Little Sister B is to the point where she will take a few steps in between places or people, but hasn't found the drive to really walk yet. As soon as she fully understands the mechanics, I know she is going to be excited to discover how much fun she can have strolling with HABA's Ducky Duck Pulling Animal. First thing in the morning, Big Sister E likes to take Ducky Duck for a walk. I think it helps both of them prepare for the day. 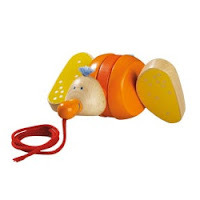 A nice change from the usual dime-a-dozen plastic toys, Ducky Duck is constructed out of beech wood, colorfully stained orange and yellow and even has a little feathery blue tuft on the top of its head. Simply grab hold of the pulling string and it is ready to waddle along on whatever adventure your child is imagining. In her mind, Big Sister E has walked Ducky Duck to the store, to the doctor's office, to the beach and more. She really loves the way that the sound changes when Ducky Duck moves from the carpet to the hardwood floor, giving a cute thump-thump, thump-thump waddling noise. Even without walking, Little Sister B has also experienced a lot of fun with this toy, pushing it around and flipping it over and over. She has even crawled along behind Ducky Duck and nudged it forward to bring it with to her destination - this is definitely an entertaining toy that spans multiple ages! When it comes time to sit and have some hand-held fun, however, Little Sister B turns to the HABA Larum Clutching Toy. She was so excited to grab and play with this, she had it out of the box and was shaking it before I could even get the tags off! 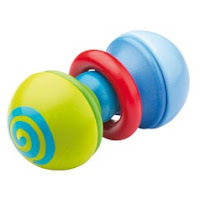 Designed to be easily held by little hands, the red ring in the middle of the Larum draws curious fingers while the wooden ends move on an elastic band and have kept both Little Sister B and Big Sister E curious and interested in the various directions that this toy can move and rattle. Both the Larum Clutching Toy and the Ducky Duck Pulling Animal represent the high quality and attention to detail that make each and every one of HABA's approximately 1500 items unique and fun. 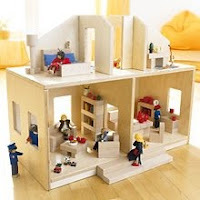 No plastic, no music, no flashing lights, just natural materials treated with nontoxic stains and finishes and run by imagination and kid-power alone. Found around the world (in over 50 countries! I'm sure there's a store near you!) HABA has made life a little more fun and child-friendly for all of us, no matter the age, ability or particular interests of each child. There really is something for everyone and you can be assured that whatever you select will be imaginative, support development, promote eco-friendly and green practices and be a welcome addition as a gift or for your own child. 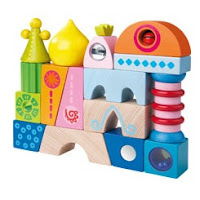 Thanks, HABA, for your huge variety of superior, distinct toys that delight children from all ends of the earth and for being such a wonderful, environmentally-friendly company. From your geothermal energy to your use of solar power and timber suppliers that are reforesting, you're really doing your part to make the world a better place. And, for the way that you provide quality service day in and day out by delivering such great toys, thanks, Mail Carrier. Okay, now I feel like a terrible loser, because I had not heard of HABA? Thanks to you though I have been enlightened!! See that is why I need you around. I love the review. Thanks for making me not so clueless. Those were the only toys I saved from the kids. Those are way too good to sell in garage sales or pass on. I'm saving them for grandkids one day or heck...maybe I'll have another sometime.